Born in 1953 in Tashkent, Uzbekistan. Erkin is Uzbek by nationality. He spent five years of his youth in Moscow where he entered the Faculty of Scenery Art at the All Union Cinematography Institute where he was taught to use different methods and techniques in painting. 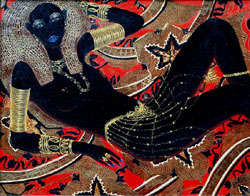 He was influenced by the cultures and mythologies of ancient Egypt and Greece. This influence is strongly reflected in his creativity. His search for new methods of conveying artistic ideas on his canvases has led him to develop an exceptionally expressive mixed media technique. He often uses gold leaf orglues sand to a canvas, adding different colours to it. The effect is that of a soft, deep velvet with a texture reminiscent of strongly sun tanned or black skin. He has exhibited his work at different level exhibitions and enjoyed success at the latest American Soviet Exhibition entitled 'Golden Brush' which was held at the Central Exhibiting Hall in Moscow. He is married and has one son.